A good or service that is produced in one country and then sold to and consumed in another country. Because many companies are heavily dependent on exports for sales, any factors such as government policies or exchange rates that affect exports can have significant impact on corporate profits. Compare import. See also balance of trade. a good which is produced in the home country and which is then physically transported to, and sold in, an overseas market earning foreign exchange for the home country (visible export). a service which is provided for foreigners either in the home country (for example visits by tourists) or overseas (for example banking, insurance) which likewise generates foreign exchange for the home country (invisible export). capital which is placed abroad in the form of portfolio investment, foreign direct investment in physical assets, and banking deposits (capital export). See FOREIGN INVESTMENT. Together these items comprise, along with IMPORTS, a country's BALANCE OF PAYMENTS. See INTERNATIONAL TRADE, EXPORTING, EXPORT CREDIT GUARANTEE DEPARTMENT, EXPORT RESTRAINT AGREEMENT, EXPORT SUBSIDY. Fig. 68 Export. (a) UK goods and services exports, 2003. (b) Geographical distribution of UK goods/services exports, 2003. Source: UK Balance of Payments, ONS, 2004.
together with IMPORTS they make up a country's BALANCE OF PAYMENTS - a country must export in order to finance (‘pay for’ in foreign currency terms) its imports. The combined net payment figures (exports minus imports) for (i), (ii) and (iii) are shown in Fig. 13 (a), BALANCE OF PAYMENTS entry. they represent an ‘injection’ into the CIRCULAR FLOW OF NATIONAL INCOME, serving to raise real income and output. In 2003, exports accounted for 20% of gross final expenditure (GFE) on domestically produced output (GFE minus imports = GROSS NATIONAL PRODUCT). See Fig. 133 (b) , NATIONAL INCOME ACCOUNTS entry Fig. 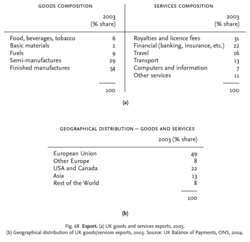 68 gives details of the product composition and geographical distribution of UK (merchandise) goods exports in 2003. See Fig. 84 , for comparable import data (IMPORT entry). See INTERNATIONAL TRADE, EXPORT MULTIPLIER, C.I.F. ( COST- INSURANCE-FREIGHT), F.O.B. ( FREE-ONBOARD), CERTIFICATE OF ORIGIN, INSURANCE, FACTORING, FORFAITING, EXPORT SUBSIDY, EXPORT RESTRAINT AGREEMENT, FOREIGN INVESTMENT, EXCHANGE RATE, EXCHANGE RATE EXPOSURE, TERMS OF TRADE. But, why is the Philippines lagging in agri-food exports among its Asean peers? Likewise, bed wear exports from the country during the first two-months of current financial year, registered an increase of 5. In 2012 we will continue to focus on increasing the exports of small and medium enterprises [SMEs], enhancing competitiveness of local companies, and raising the level of their products," he said. office of the law firm of Baker & Hostetler, LLP, practicing in the areas of white collar crime, export control, not-for-profit organizations, and business litigation. China's vehicle and auto parts exports grew much faster (by 51 percent year-on-year to $1. International trade attorneys at the Export Legal Assistance Network (http://fita. export control system, Hong Kong must continue to ensure that the integrity and autonomy of its customs territory is not compromised and that its actions do not undermine the reality or the perception that Hong Kong is separate from mainland China. The answer centers largely on declining export demand. Powers is not persuaded that the developed world, following the lead of the United States, was seriously interested in reevaluating the arms export industry even before September 11; it is even less so now in its wake. Where Republicans usually fight for reducing regulation and getting government off the back of business, when they turn their attention to export controls, they act like red-tape-loving Democrats.